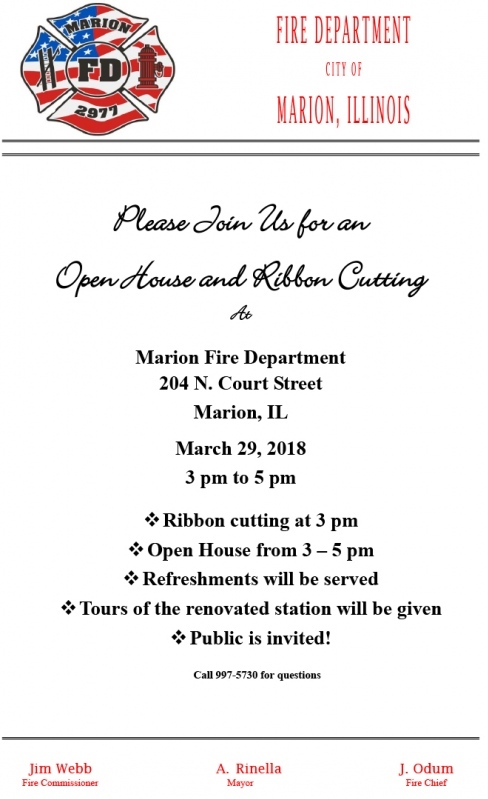 Please join us for an Open House and Ribbon Cutting Ceremony at the Marion Fire Department, 204 North Court Street, Marion, on Thursday, March 29. The Ribbon Cutting Ceremony will take place at 3 p.m. The Open House will be held from 3 to 5 p.m. Refreshments will be served. Tours of the renovated station will be given. Everyone is welcome! 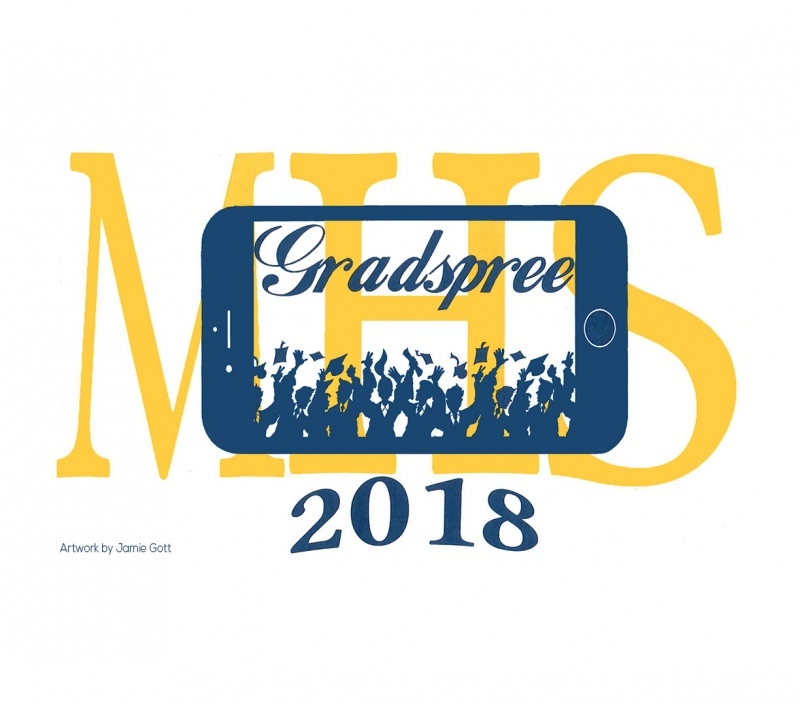 NOTE: RSVPs are now due by Friday, April 6 at noon! Registration is limited to the first 130 guests. 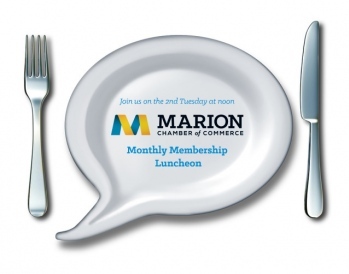 The Marion Chamber of Commerce Monthly Membership Luncheon will be held on Tuesday, April 10 at Celebrations. Lunch service begins at 11:45 a.m. 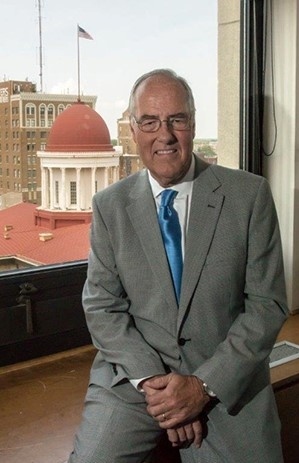 The speaker will be Roman Basi, who will speak about the new IRS tax law update. 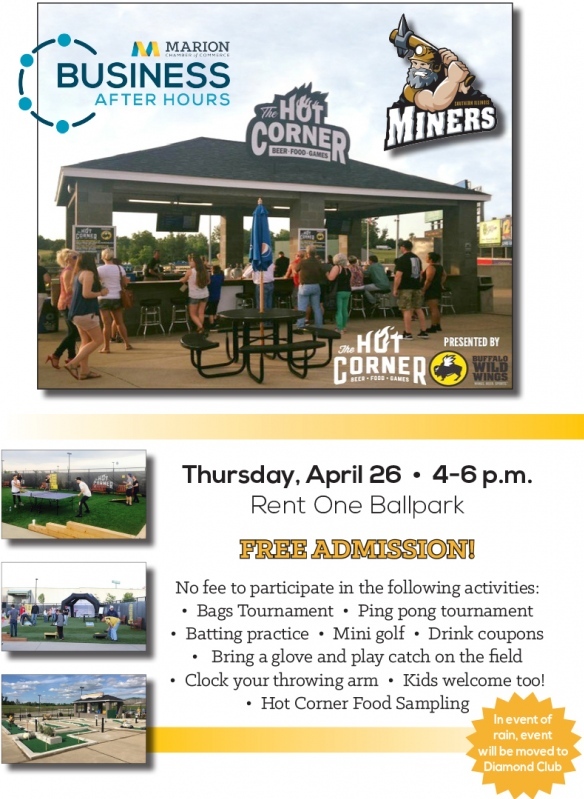 Buffalo Wild Wings will be the caterer. The menu will include three naked tenders, potato wedges, side salad, mini chocolate fudge cake and sweet tea, unsweet tea, water and soda. Specialized Equine Services and Therapeutic Riding is the sponsor of the April Monthly Membership Luncheon. 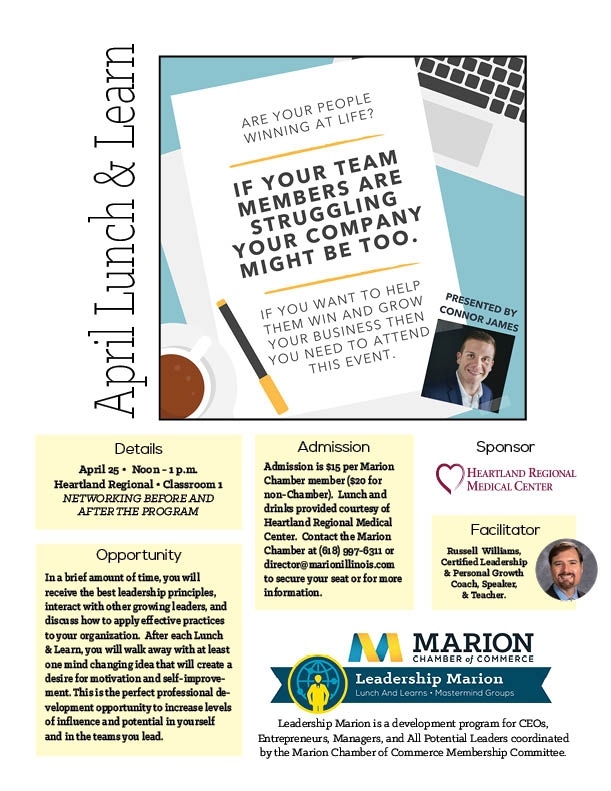 The April Lunch & Learn will be held on April 25 from noon - 1 p.m. at Heartland Regional Medical Center, Classroom 1. The topic will be "Helping Your Team Members Win at Life and Work." The April Lunch & Learn will be presented by Connor James who believes your life is meaningful. He's a speaker, host of the Creating MeaningFull Moments Podcast, and founder of MeaningFull Books. 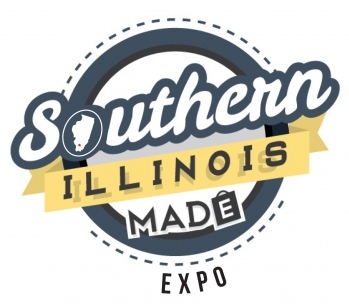 Admission is $15 per Marion Chamber member ($20 for non-Chamber). Lunch and drinks provided courtesy of Heartland Regional Medical Center. 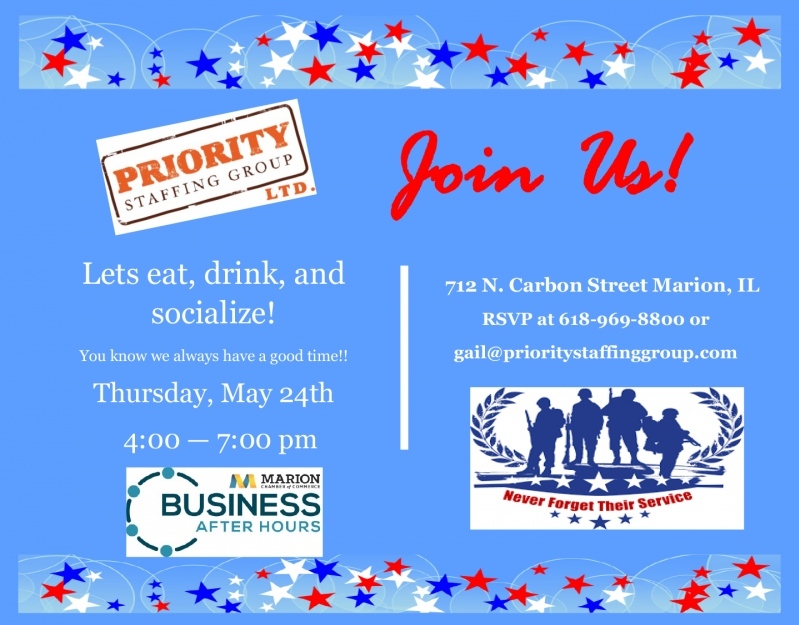 A Business After Hours program will be held on Thursday, May 24 from 4-7 p.m. at Priority Staffing Group, 712 North Carbon, Marion. Let's eat, drink and socialize! Are you ready for something different? We have something for you! 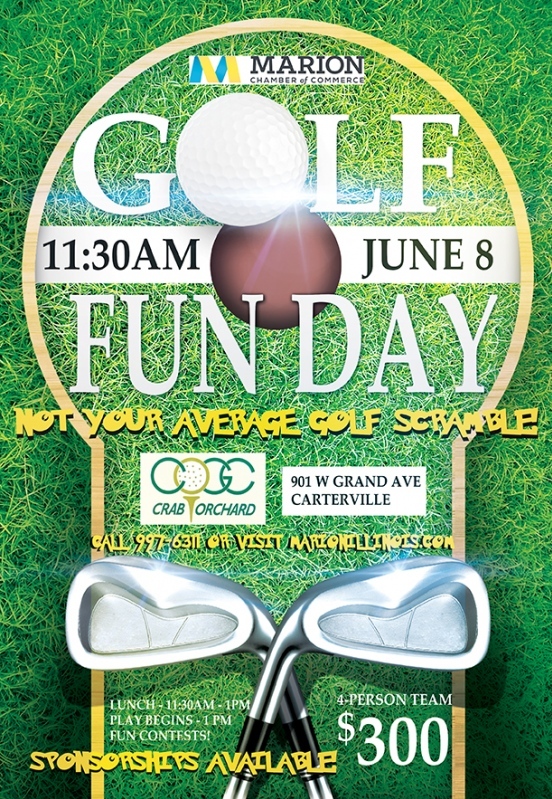 Marion Chamber of Commerce presents the inaugural Golf Fun Day on Friday, June 8 at Crab Orchard Golf Club. This event is NOT your average golf scramble! The event will begin with registration at the Clubhouse from 11 a.m. to 12:30 p.m., followed by lunch and cart decorating from 11:30 a.m. to 1 p.m. Lunch will be catered by Crab Orchard Golf Club and includes hotdogs and brats, pasta salad, chips and drinks. Hotdogs and brats and drinks, as well as all scoreboards will be available at the pavilion (accessible from holes 1, 2, 9, 10 and 12) throughout the entire event. 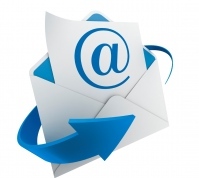 Thank you to Clearwave Communications, the event's Loitering Sponsor. Play begins at 1 p.m.
Chips and salsa and drinks will be available at the pavilion after the event concludes during the award ceremony until 7:30 p.m.
Hole 1 - Water balloons: All golfers will tee off with their ball/tee surrounded by water balloons (provided by the Chamber). Hole 2 - Convince the Live Hole Sponsor at this hole to vote for your team for the Best Themed Team/Best Appearing Crew award. The prize will be given out after the play ends. Hole 3 - Hit from the Throne. Players have to drive from a toilet placed at the tee. Hole 4 - Convince the Live Hole Sponsor at this hole to vote for your team for the Most Team Spirit award. The prize will be given out after the play ends. Hole 5 - Tennis ball long drive challenge: See who can get the most distance hitting a tennis ball (provided by the Chamber) instead of a golf ball on this hole. A prize will be given to the golfer with the longest drive with a tennis ball. Hole 6 - Random Club Challenge: On the tee box, all golfers will draw a card out of a box that will assign them the club they must tee off with and then play out to the green with only that club. No trading allowed. Hole 7 - Convince the Live Hole Sponsor at this hole to vote for your team for the Best Decorated Cart award. The prize will be given out after the play ends. Hole 9 - Elimination hole: For this hole, once you use a player's shot, they are out for that hole. Then, the second shot person gets to sit out with the tee shot person. Once the fourth player is out, all players get to play again. Hole 11 - Worst drive: For this hole, all golfers will play from the their team's worst drive. Hole 13 - Putt Trifecta:Take your shot and then you can choose which flag on the green (red, white or blue) you will putt to. Hole 14 - Putt Opposite Hand: Players are given a putter for their opposite hand while on the green (left and right putters will be available to use on this hole). Hole 16 - Speed hole: Teams are timed from tee off to hole out by the Live Hole Sponsor at this hole. The fastest time wins. Winner is announced at the conclusion of the day. A prize will be given to the fastest team. Time doesn't start until the previous team clears the hole. Hole 17 - Gopher It: On this hole, pay $1 for each point you want to add to the team's score behind you on the course. The Live Hole Sponsor will pass along the news to the next team that the points will be added to their score on Hole 16. Hole 18 - Oven mitts: All golfers will tee off while wearing oven mitts (provided by the Chamber). Longest drive while wearing an oven mitt wins a prize. The Marion Chamber Golf Scramble Committee will choose the team with the "most honest/worst" score and award that team with a prize. Your sponsorship will go toward the purchase of the prize. Tickets for the “Lucky Umbrella” (umbrella filled with lottery tickets) will be sold at the Registration Table and on the Chamber Cart: one (1) ticket for $5 or 5 tickets for $20. The drawing will be held at the end of the event. Your sponsorship will go toward the purchase of the lottery tickets. Sponsorship includes registration table sponsor recognition and sign. Sponsorship includes hole sponsor recognition and sign. Sponsorship includes sponsor recognition and sign and placement of logo on all Mulligan tickets.